There has been a great deal of interest in the last year or so in the link between cluster of differentiation 38 (CD38) and the decline of nicotinamide adenine dinucleotide (NAD). 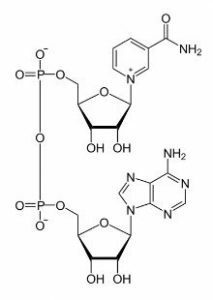 NAD is a dinucleotide, meaning that it consists of two nucleotides joined via their phosphate groups. One of the nucleotides contains an adenine base and the other nicotinamide. Nicotinamide adenine dinucleotide exists in two forms, an oxidized and reduced form abbreviated as NAD+ and NADH respectively. In the metabolism, nicotinamide adenine dinucleotide is involved in redox reactions, moving electrons from one reaction to another. As previously mentioned, this coenzyme is found in two forms in cells: NAD+ is an oxidizing agent – it accepts electrons from other molecules and becomes reduced. This reaction forms NADH, which can then be used as a reducing agent to donate electrons. These electron transfer reactions are the primary function of NAD but it is involved in other cellular processes too. One of these is forming a substrate of enzymes that add or remove chemical groups from proteins, in posttranslational modifications. Due to the importance of these functions, the enzymes involved in NAD metabolism are of intense interest to researchers. Nicotinamide adenine dinucleotide is a coenzyme present in all living cells and it is absolutely essential for the function of our cells. NAD is needed to silence genes that accelerate the aging process and is a fundamental part of our metabolic system. NAD is also associated with the sirtuins, which are closely linked to longevity in mammals. CD38 is an antigen and a multifunctional enzyme that uses NAD as a substrate to generate second messengers, nicotinic acid adenine dinucleotide phosphate (NAADP) and cyclic adenosine diphosphate ribose (cADPR). Originally identified as a cell-surface enzyme involved in the immune response, inflammation, cancer and metabolism.CD38 has been identified as one of the main cellular NADases in mammalian tissues and appears to regulate the cellular levels of NAD in multiple tissues. Enzymes such as poly (ADP-ribose) polymerases (PARPs), NAD-dependent deacetylases (Sirtuins), and finally NADases such as CD38 all degrade NAD during their operation. In mammals the CD38 enzyme is one of the primary enzymes that degrade NAD and so reducing its impact is of potential interest for combating the effects of aging and chronic inflammation. A recent study showed just how greatly the level of CD38 NADase increases during the aging process (1). As we age the level of CD38 starts to rise and in direct correlation to this the level of NAD begins to fall. Combined with this decline of NAD comes an increasing level of mitochondrial dysfunction mediated at least partly by the activity of SIRT3. The researchers in this study also identified that the increasing levels of the CD38 enzyme is the main reason for the degradation of nicotinamide mononucleotide (NMN), a NAD precursor. This implicates that CD38 has a primary role in age-related changes to metabolism and diseases. The reason why CD38 increases was not confirmed in the study. However CD38 is associated with various sources of inflammation such as immune responses to pathogens and injuries, crosslinks, as well as being found in the senescence associated secretory phenotype (SASP) that accompanies senescent cells which also accumulate with age (2). The increasing levels of CD38 deplete NAD+ which is needed for other cellular processes so understanding its causes and regulating them is critical. This new study also puts an earlier study from 2013 into further context (3). That study showed that flavonoids quercetin and apigenin both increased NAD+ levels by actively inhibiting the CD38 NADase, resulting in changes to protein acetylation, likely via interaction with SIRT1. The anti-inflammatory and antioxidant properties of flavonoids are well known so it probably should be no surprise that it inhibits pro-inflammatory NADases such as CD38. The researchers noted that CD38 knockout mice (mice engineered to be unable to create CD38) had an improved median and maximum lifespan compared to wild type mice when both given a high fat diet. The same increases in lifespan are not observed in PARP1 knockout mice and in fact a decrease in lifespan was observed. This can be likely explained when considering the fact that PARP1 is involved in genomic stability and DNA repair, it suggests that CD38 is less important than PARP1 is to cell function. Given that genomic instability is a primary hallmark of the aging process and involved in the development of cancer this is hardly a surprise. The team also discovered that CD38 is also present in the mitochondria as well as the rest of the cell, where it regulates mitochondrial NAD+ levels as well as sirtuin activity in the mitochondria. The study also showed that the inhibition of CD38 could potentially be used to treat obesity and other similar metabolic disorders. Taken together these results suggest that preventing the rise of CD38 could be a promising strategy for protecting NAD+ levels and thus enhance sirtuin activity to treat metabolic conditions. Quercetin and better still isoquercetin with its superior bioavailability and absorption both hold great potential in reducing inflammation and fighting back against the rise of CD38. It is also yet more support for the positive health benefits of quercetin supplements and another reason to consider adding it to your supplement regimen. (1)Camacho-Pereira, J., Tarrago, M. G., Chini, C. C., Nin, V., Escande, C., Warner, G. M., … & Chini, E. N. (2016). CD38 dictates age-related NAD decline and mitochondrial dysfunction through an SIRT3-dependent mechanism. Cell metabolism, 23(6), 1127-1139. (2)Coppé, J. P., Desprez, P. Y., Krtolica, A., & Campisi, J. (2010). The senescence-associated secretory phenotype: the dark side of tumor suppression. Annual Review of Pathological Mechanical Disease, 5, 99-118. (3)Escande, C., Nin, V., Price, N. L., Capellini, V., Gomes, A. P., Barbosa, M. T., … & Chini, E. N. (2013). Flavonoid Apigenin Is an Inhibitor of the NAD+ ase CD38. Diabetes, 62(4), 1084-1093.